JENN: Did you run last week? MOON: I did! A bit rather slow and steady, but it happened. Did you? 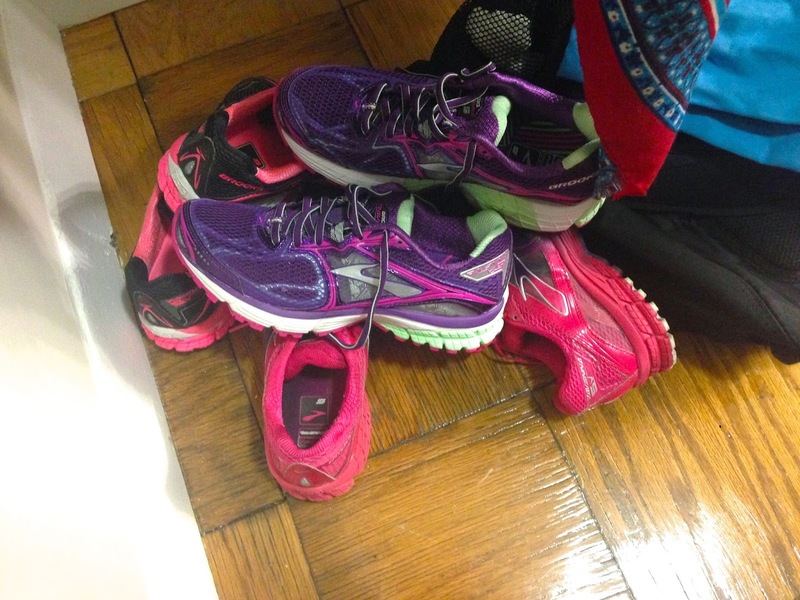 JENN: I did one regular long run plus two shorter speed runs where I upped my top speed. My five minute sprints are now one minute each at 8, 7.5, 7, 6.5, 6mph, then five minutes at 5.5 mph, repeat. Even though that's only a top speed increase of .5 mph, my legs were TIRED by the end. MOON: That's awesome! Personally, when I can get to 8 mph-- even just for a little bit-- I feel like I'm at my normal, if that makes sense. Or, at least, it's a good baseline to have. JENN: Haha, I do NOT. Maybe for the first go-round, but I have to dig a little, especially for the last sets. I am slow! But I think this speed work is moving me a long a little. JENN: I think I'm gonna bite the bullet and buy new sneakers this week. That'll help too. Gonna hit up the Roadrunner Sports down the road and see what they can show me. MOON: I think I'll need to budget in some new shoes, too. I've had mine since February, I think?Anyway... the past few runs I've noticed a definite mold that isn't complementing my runs well. My foot is also going numb after 30 minutes. JENN: Uh, that's not great? MOON: Yeah, that's new. BUT for the months that pair of shoes was good, they were great. JENN: Perhaps one day we shall win the lottery and then we can buy ALL THE SHOES. MOON: Anything new you plan on trying out? JENN: I'm gonna ask for the Ravenna 6 - I've been using the 5 - and then tell them to bring out whatever else they think might be good. Can't hurt to give it a go! MOON: Very nice! Be sure to let me know how it goes! JENN: I will! While you're all waiting, here's the roundup. - From Dancing to Running trains while away from home. - Pink Elephant on Parade considers the mindset behind signing up for a marathon. - Run Eat Repeat rightfully believes that running is for every body. - easyWDW visits a WDW Senses Spa. - Mouse on the Mind adds a hypothetical GOOD book store to WDW. - Disney by Mark zones in on Matsuriza drummers in Epcot's Japan. - Eating WDW snacks at Epcot on the cheap.